Multi-phase x-ray & neutron powder diffraction analysis/simulation. Single-crystal diffraction, TEM auto-indexing & stereographic projections. Crystal & Molecular Structures Visualization FREE DOWNLOAD! Welcome to CrystalMaker Software: creators of elegant, powerful software for crystalline and molecular materials. Our focus is in using interactive graphics to empower users with a vivid visual understanding of structure and properties: to "see the wood for the trees". Our award-winning software is now used by thousands of scientists, engineers and students - spread across 6 continents and over 60 countries. From crystal structure to diffraction pattern: our modular software leads the way - and its easy and fun to use! You choose which product(s) and which platform(s) you need. Even better, take advantage of our flexible site licensing so you can share all our software with your colleagues and undergraduate students across your institution. Engage your students with immersive 3D content, challenge them to "learn through play" in their own time - and demonstrate genuine "value returned" for their tuition fees. Whereas other programs are designed for small, single molecules — or fixated on old-world crystallography — CrystalMaker is a breath of fresh air! Powerful crystallographic tools, without the pain; an engaging, interactive interface that's simply a better way of working. CrystalMaker X features fast, photo-realistic Retina graphics for an engaging visual experience that includes - for the first time - rotatable, scalable animations: the ideal way to understand structural behaviour, lattice dynamics - or the trajectory of a simulation. For the full 3D experience, try our 3D viewing modes, including 3D stereo in colour: an ideal way of sharing visualization with colleagues and students. Build rotatable models for iPad or Mac, or generate 3D files for printing. But CrystalMaker X goes way beyond mere visualization, with energy-modelling tools, letting you build new structures, optimize them - and engineer entirely new materials. 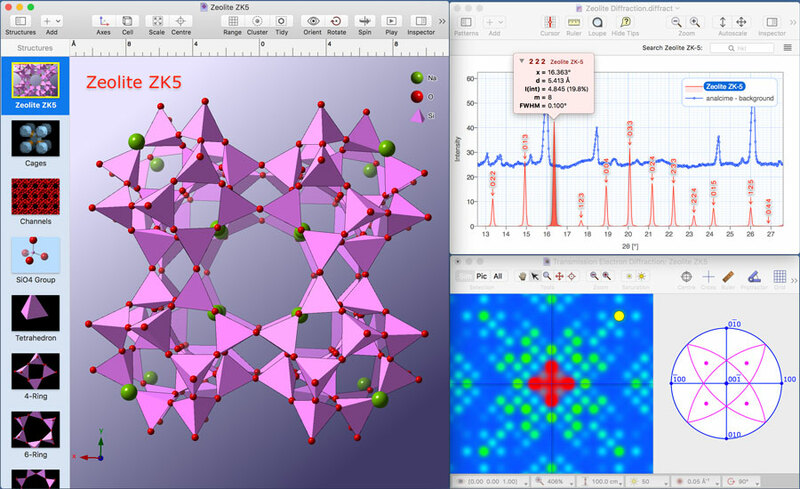 CrystalMaker can be extended to simulate x-ray and neutron powder diffraction patterns, using CrystalDiffract. Featuring real-time parameter control, mixture generation and comparison with real data, CrystalDiffract is an ideal way to characterize your diffraction results! SingleCrystal (Apple Design Award, 2007) lets you simulate x-ray, neutron or TEM diffraction patterns from single crystals - and compare with observed data in the same window. SingleCrystal interfaces with CrystalMaker, so as you rotate a crystal structure in CrystalMaker, its simulated diffraction pattern and stereographic projection rotate in SingleCrystal. SingleCrystal features easy measurement and auto-indexing tools, high-resolution graphics and powerful data output. Your time is valuable, so don't waste it with imitation software. Take advantage of our award-winning original design, intuitive interfaces, integrated workflow, first-class technical support - and regular, free incremental updates. Genuine Native Software. We are professional software developers, registered with Apple and Microsoft and using their official developer tools to develop real, native software for each patform. These genuine Mac and Windows applications are highly-tuned to deliver the optimum performance and user experience for each platform - and we support the latest operating systems, including macOS 10.13 "High Sierra" and Windows 10. We Love Mac. Because we write true Mac software, we're able to offer our Mac users the best-possible performance out of your hardware, combined with the superlative user experience you expect from a properly-written Mac application. Simple things like multi-touch control, Retina graphics, Quick Look thumbnails and previews, QuickTime video, Code Signing for hassle-free downloads and security - they all add up to a great user experience that helps justify your choice of the Mac platform. If you spend a fair amount of time in front of your computer, you'll appreciate the difference our no-compromise approach makes. And if you've recently bought a new computer, you'll really see the difference! Learn More about our software in this illustrated brochure (5.4 MB).